Found a problem or incorrect information? Ask for a web update. To request an update to an existing website, use the project request form and select “Website/web page edit or update” as the project type on the second screen. Need assistance with your website? If you have questions on using WordPress or need assistance with your website, we’re here to help. We are now offering open office hours once a month. 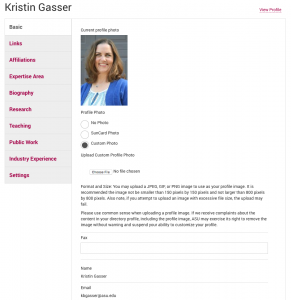 Need a new faculty website? Here are your options. In January of 2017, ASU fully implemented a new directory system called iSearch: isearch.asu.edu. 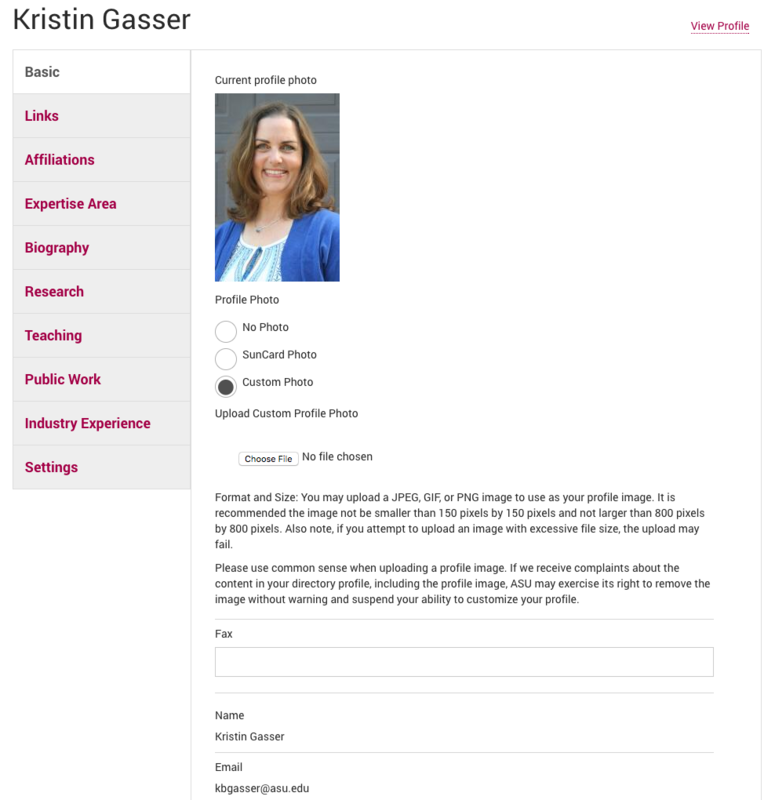 iSearch is a robust system which displays personal profiles for everyone at ASU, replacing the ASU Directory. You can update your information directly, any time you like, no coding required. What will someone see in my iSearch profile? Example of an iSearch Profile editing page, showing all the items which can be added to the directory. Ready to use iSearch as your website? Should you choose not to use iSearch, other options are available at ASU for Fulton Schools faculty. All use Content Management Systems (CMS). CMS websites allow the content to be managed easily by the user, no coding required, in a word-processing, push button-type interface. ASU University Technology Office (UTO) has started a new service specificallly for building faculty websites at web.asu.edu. This is a build-your-own website solution that conforms to ASU Web Standards, is easy to setup, and no coding experience is required. Get the full details at web.asu.edu. Web.asu.edu sites use a content management system (CMS) called Drupal, and technical support for web.asu.edu sites is provided by UTO, not the Fulton Schools. UTO also offers a more generalized website tool called “Webspark” which is an out-of-the box, ASU Web Standards-compliant website building tool for any type of website. Webspark sites can be developed quickly, with little or no coding experience required. Webspark also uses the Drupal content management system, and technical support is provided by UTO, not the Fulton Schools. Update for Fall 2018: We are not able to create new faculty websites at this time. We are currently working on a project to offer free WordPress websites and hosting for faculty. We appreciate your patience during this time. Our team can still assist with websites that are urgent in nature and require a specific deadline. Please email Jennifer Di Sano for details. The Fulton Schools use WordPress, a very popular content management system, and our Marketing and Communications office can provide an ASU Web Standards-compliant WordPress site for faculty. Our services include setting up the site and, if needed, populating the site with initial content provided by the faculty member. While the Fulton Schools pay for hosting, content maintenance is provided by the user. For initial site setups, we can help you move content from an existing website hosted elsewhere. We have limited resources to help with customizations after a site is up and running. Domains for new websites should follow the format of yournamehere.engineering.asu.edu. “Managed” hosting means that behind the scenes we keep your website code base up to date and create automated backups so that your site is secure. Complete our project request form and select “New website” as the Project type (on the second screen). Here are some current faculty sites for content ideas. New sites will follow the ASU Web Standards. For all other website-related requests, contact Jennifer Di Sano.